Knit Nat: I'm Back! 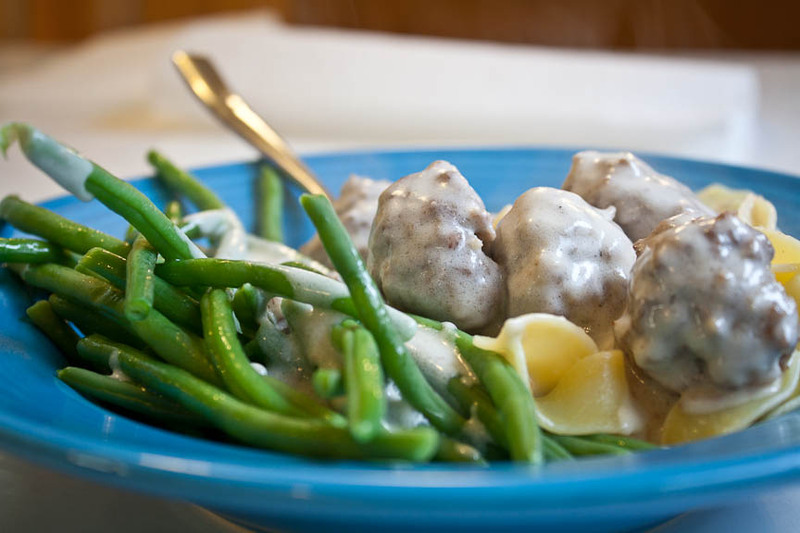 Swedish Meatballs! Sorry for the month-long silence. A lot has been going on and also I've been really lazy. I thought there'd be no better way to start blogging again than with a recipe for Swedish meatballs! This is a really quick dinner. I recommend making a double batch and freezing half of the meatballs on a parchment-lined cookie sheet and then placing the frozen meatballs in a ziploc for another time when you have even less time. Preheat oven to 375 degrees. When the bread has soaked up the milk, smash it up with a fork and gently squeeze out most of the milk. Mix together the meat, egg, onion, bread, salt, pepper, allspice and nutmeg. Form into 1-inch meatballs. Place them on a cookie sheet and bake for 20 minutes. Add the egg noodles when there is about 10 minutes left on the meatballs. Place the green beans in a pot and cover the bottom of pot with water. Cover and turn heat to high. When meatballs are 7 minutes to being done, melt the butter in a small saucepan over med-low heat. Whisk in the flour and cook while stirring for a couple of minutes. Stir in the chicken stock and bring to a simmer. Let it thicken for a couple of minutes. Add some salt and pepper to taste. Add a dash of allspice and nutmeg too if you want. Add the sour cream and turn to low. Add the meatballs to the sauce and scrape in any yummy bits that may have ended up on the cookie sheet. Drain the beans and noodles when they are done. Pour the sauce and meatballs over beans and noodles. Thank You, Anna. I finally made a quilt.